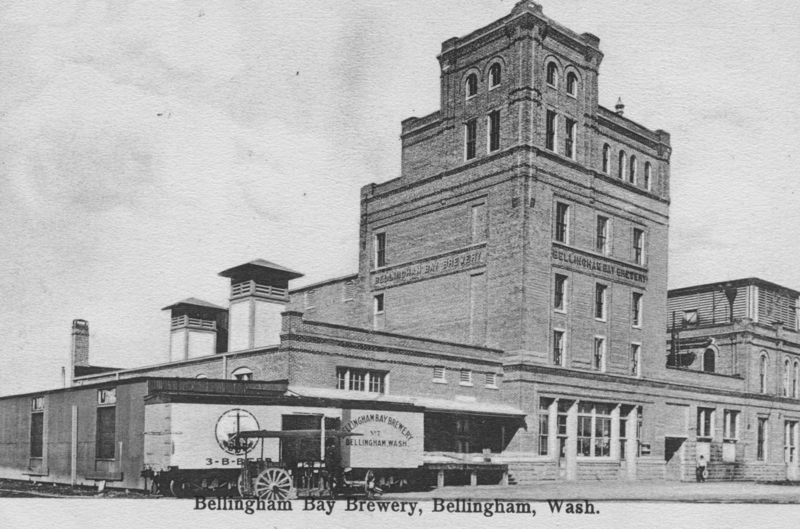 When Boundary Bay Brewery opened in 1995 I was a junior at Sehome High School. It wasn’t till years later when I was in College that I started going to Boundary for beer. Craft beer was still establishing itself and I was just getting into beers other than Pabst. I would say that my first beer sampler here probably taught me more about beer than anything else before becoming a brewer. The great thing about beer samplers is that they allow you to try different beers side by side so that you can see how different malts and hops create totally different flavors. It also helped me identify what I like and/or don’t like about certain beer styles. 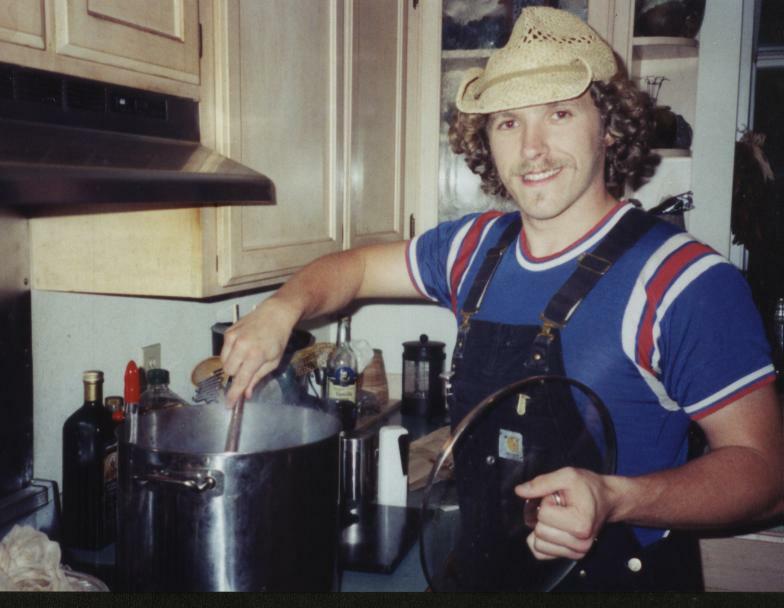 When I first started homebrewing Skip Madsen was the head brewer here and he was a great mentor to me in my brewing career. 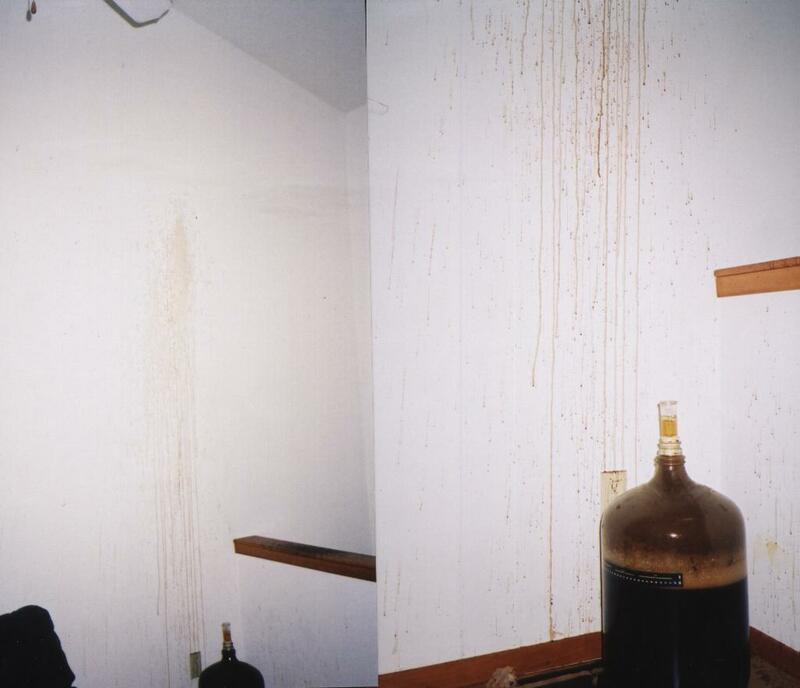 Before becoming one of Boundary’s brewers, I used to bring Skip my homebrew and he’d give me feedback and some more yeast to go home and brew with. 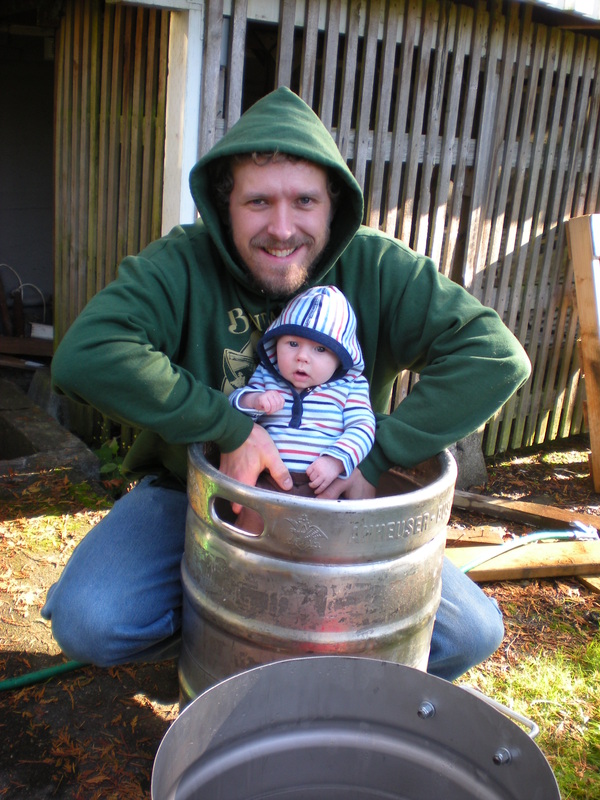 By the time I started working at Boundary Bay Brewery in 2005, he had already moved on to Water Street in Port Townsend. 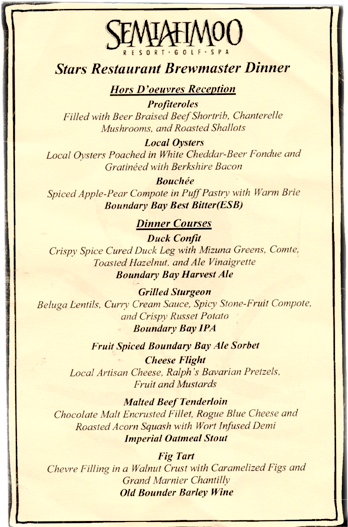 This last week Boundary Bay celebrated 15 years of “saving the ales” and I realized that I’ve been here for the last third of that. I have been witness to many changes at Boundary Bay over the last five years. Since I started working in the Brewery we’ve grown to the second largest and then the largest brew pub in the country for a few years running…which has required some changes in the brewing process here. 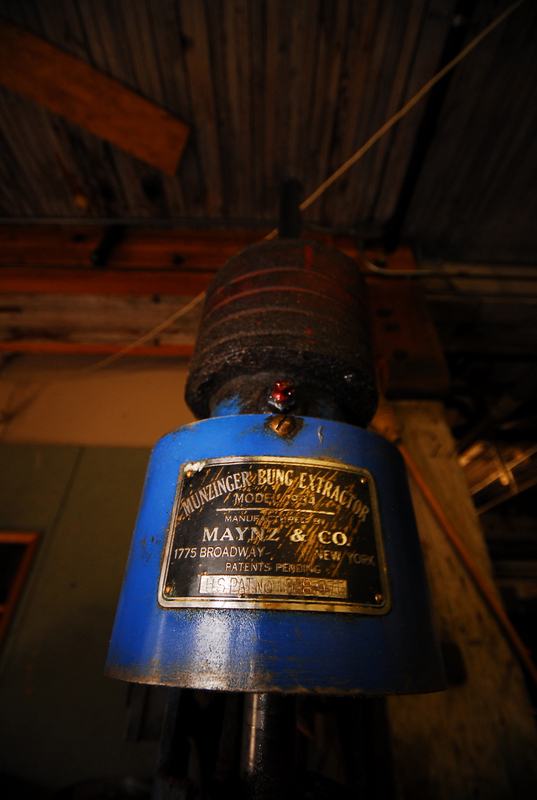 The first thing I would mention is the Munzinger Bung Extractor built in 1934, but only brought here a few years ago. This replaced the previous system of sitting on the keg and popping the bungs out one at a time with a chisel and hammer while wearing one of Skip’s old hockey goalie gloves. I used to fill kegs one at a time as well, but now have the “Octo-filler” that Adam Lent built. Now I can now fill eight kegs at a time. This is good because our production level here has grown steadily over the years. I’ve heard tales about back in the day when they used to only brew a few times a week. We now brew pretty much every day. Some days we do two batches, so we’re averaging 7-10 brews a week. In the summer, in particular, it is always a juggling act to make sure that we never run out of anything. Locally, we sell lots of Scotch ale, but overall IPA is by far our biggest selling beer. Of the 7-10 batches brewed a week IPA is going to account for at least four of those. There has definitely been a shift in which beers we sell more of now than 10 years ago. 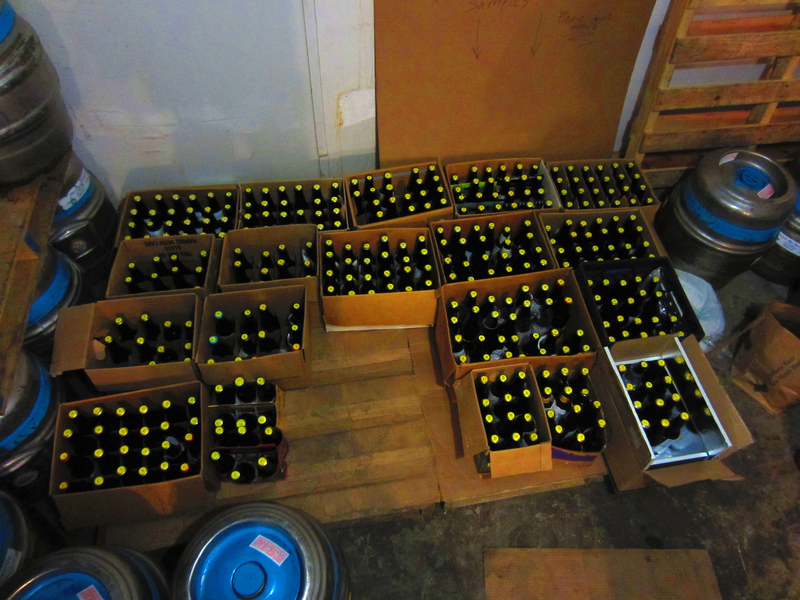 We have also developed some new beers over the years. Some like the Triple, we brewed last year, remain (sadly) a one time brew. Others, like the Imperial Red and the Single Hop Series, have become annual seasonals. There have been changes in equipment like our new mash tun, which is way more efficient than our old one. Despite the changes with equipment over time, the focus remains to keep the beer consistent and delicious. 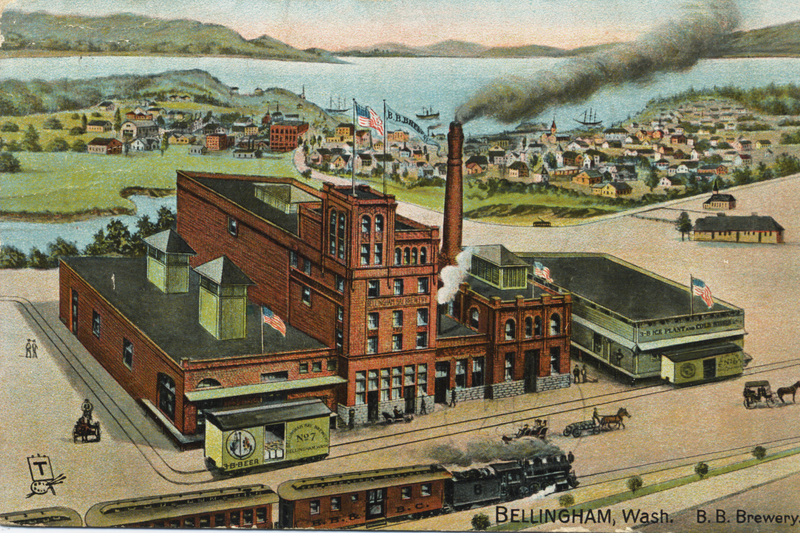 Looking back, I have also seen tremendous growth in the Bellingham and national beer culture as well as the evolution of craft beer in our country. There are some great interviews I’ve read from the pioneers of craft brewing that I find really inspiring. These guys were inventive, original, & often rebellious, fighting against archaic beer laws and big breweries with deep pockets. Also, we as a culture didn’t know as much about different beer styles or what a good beer is. It was revolutionary to get anything besides an ice-light, dry-draft, all-tasting-the-same lager. Now I think that the craft beer industry as well as the public’s palate have developed to the point where it’s not enough to just make something different, it’s got to be good. Especially when you look at all the choices we have now compared to ten years ago. I’ve really enjoyed working in the craft beer industry. 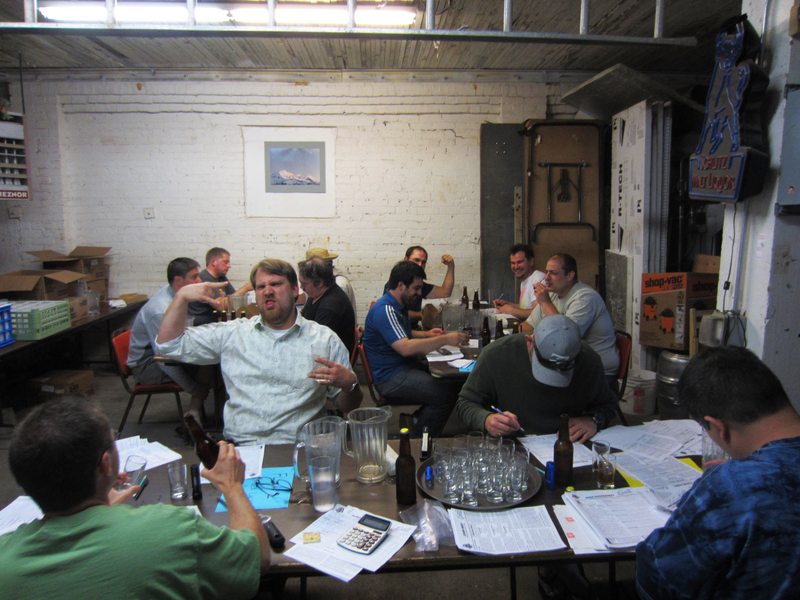 The people who drink the beer and the people I make it with are awesome. 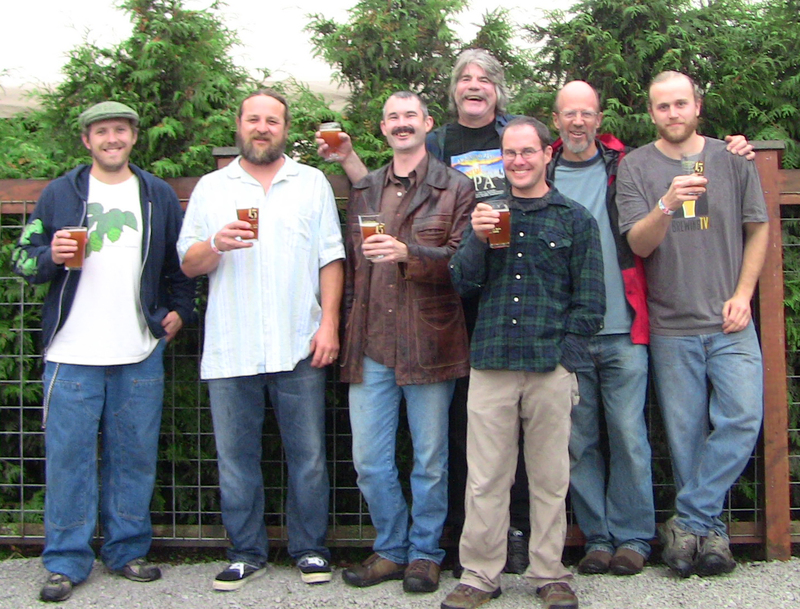 At our 15th anniversary party, I had a chance to meet up with Boundary’s brewers new and old. It was really cool to hang out and have a beer with all the brewers that have climbed in and out of that kettle over the years. Cheers to Howard, Dave, Skip, Aaron, Steve, and I guess me. 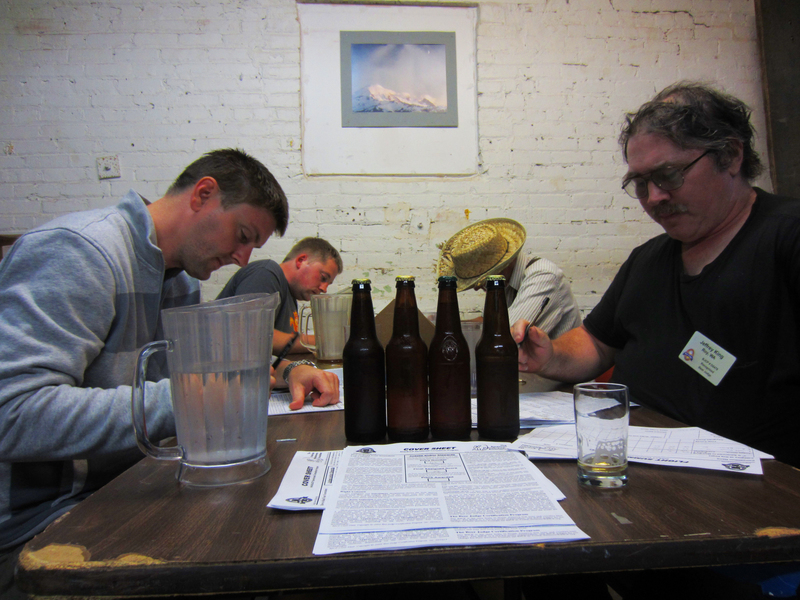 I’m proud to be part of the brewing tradition here; following in these guys boot prints. It’s very rewarding to me to be able to see our tap room full of people from all walks of society relaxing and enjoying a beer and a meal together. 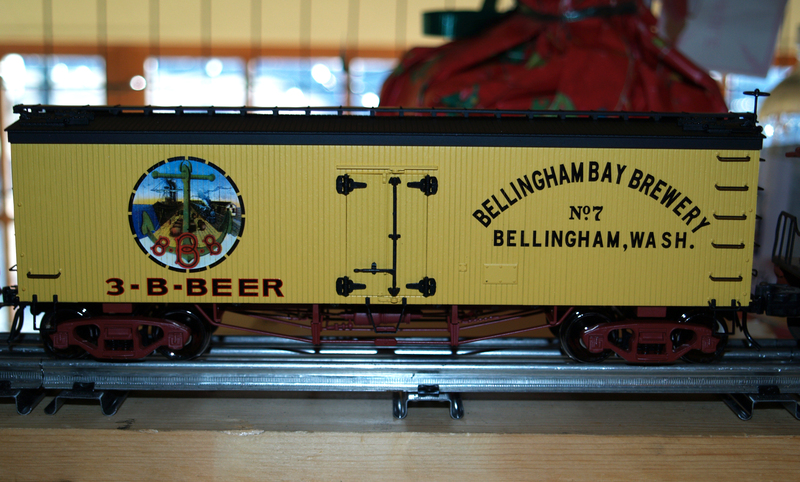 Pub is really short for “public house” and that’s how I think of Boundary Bay. The owner and manager do a lot to support local charities and give back to the community and when I see people hanging out here I can’t help but feel that Boundary Bay is part of the glue that holds this town so close together. Congratulations to Ed and everyone at Boundary for 15 great years and a huge thank you to everyone supports us and keep me making beer. While filling kegs, my mind often wanders off into non-beer related realms. The other day I was thinking about centaurs, you know from Greek mythology- half man/half horse. My first thought was I don’t know how they were created but I bet a horse, not a human, gave birth to the first one, because imagine it the other way around, not gonna work. I’ve read my fair share of fantasy fiction and it seems that centaurs eat a lot of food and can drink quite a bit of beer in one sitting. Do they have two stomachs, a human and a horse? Or do they just have the one big horse stomach? 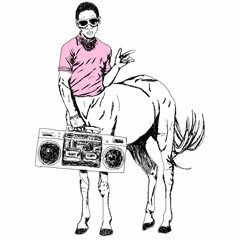 You never read about centaurs putting down three pounds of bacon, so it makes me think they couldn’t digest meat in their horse stomachs. But if you had to eat enough grain for a a horse everyday through a human mouth your teeth would be ruined. I don’t know what the nutritional needs of the average horse is, but I know they eat a lot. Another thing that bothered me about centaurs is that they are always depicted as these big buff men, but it doesn’t make sense to me. Why are they so ripped? Physiologically there are a lot of issues to figure out. Going back to the eating, do they bend over and graze all day, which would kill your human back/neck? Or are they harvesting grain and they shoving it in their little human mouths 20 hours a day? Mostly I picture centaurs running around shooting arrows and stabbing people with spears. It makes sense that their horse body is strong but the human body doesn’t. I can’t imagine a centaur doing a push-up or chin-up, it would be impossible. So how is their human torso so strong then? It makes me think that the traditional image of centaurs is all wrong. They should be a strong horse body with a wimpy human torso attached with really bad teeth prancing about the forest. That’s another thing about the common image of centaurs running around the forest; horses don’t live in forests, they live in plains. Oats, barley, ect. don’t grow in forests, so if centaurs live in forests it makes the eating thing even more confusing. One thing that is certain to me is that centaurs would probably make awesome brewers. First of all to drink enough beer to get a horse body drunk they would have to make their own just to make it affordable. Secondly, if I was a centaur I would plow my own field and grow my own barley and oats (for oatmeal stout). I recently learned from Kevin, the head brewer at Chuckanut, that cows can more efficiently digest spent grain from brewing than raw grain. For the centaur spent grain from brewing would mean eating less (and wearing down less molars) while making beer. Also if a centaur made more beer than they could drink they could easily distribute it themselves. I think it would be cool to drink a few beers with a centaur. I wonder if he could give me a ride home afterwards? Yiamas! (Cheers in Greek, pronounced yia-mas).